Important note: On this page the connectors pinout are always given looking at them from the front side and not from the solder side. The midi interface is used to connect the Atari to electronic musical instruments. It uses asynchronous signals (8 bits plus start and stop bits) at 31250 bauds (bit/sec). The Atari interfaces midi through a dedicated 6850 ACIA (Asynchronous Communication Interface Adapter) chip as shown on the right. 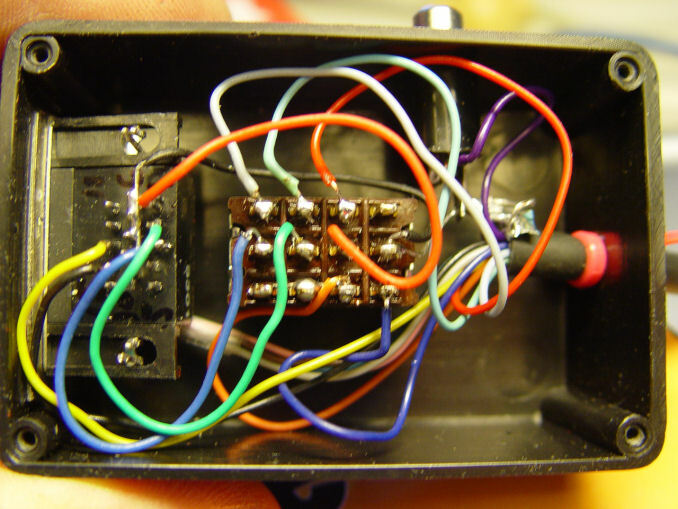 Note the unconventional connection of Midi Thru signals to pin 1 & 3 of the out midi connector. This allows to have a midi thru interface without the cost of an extra connector. Note that a shield is connected on the Midi Out connector which is not following the midi standard. It is therefore recommanded to use cable without shield connection. For the Midi In connector there is no shield which is standard midi. It is possible to use standard Midi cables for the Midi In and the Midi Out connection to/from the Atari. However it is mandatory to check that the cable connected to the Atari Midi Out does not have any wires connected to pin 1 & 3. This should be the case if you use a "standard midi cable" as describe below, but sometimes you will find DIN5 male-male audio cables that connects all the pins. This interface allows to use a ROM cartridge with a maximum size of 128KB. It connects the internal bus with the cartridge connector as described below. This interface is used generally for communication with other computers or with modems. Most of the connection comes from the USART (Universal Synchronous/Asynchronous Receiver/Transmitter) inside the MFP68901 with the exception of the DTR and RTS signals that comes from the I/O port of the sound chip. The modem interface on Atari ST computers follows the RS232 standard apart from the following non-tested information: The CTS signal (that usually indicates that the modem is ready to take the next character) is connected to input I2 of the MFP68901 and generates an interrupts used by the system to start transmission. Therefore the CTS has to be pulsed (i.e. transitioned) for each character to send (in other word keeping it asserted does not work). As the RTS is pulsed for each character to send it can be directly connected to CTS. Again this is information coming from "the Atari ST bible" book and I did not verified it? 4 RTS Request to Send. Connection to a modem uses a normal modem cable (e.g. DB25F-DB25M or DB25F-DB9M). Connection to another computer (e.g. a PC) requires a null modem cable (e.g. DB25F-DB25F or DB25F-DB9F). Plese refer to the RS232 Standard for description of these cables. The parallel interface also called the printer interface of the Atari is somewhat standard but is missing several standard signals found on PC's parallel interface (see description below). The printer signals are connected mostly on the Yamaha sound chip I/O ports! The only exception is the Busy signal that goes to input I0 of the MFP68901, and therefore a transition on this pin generates an interrupt. The other signals shown in the schematic on the right are used in the Audio/Video Interface (audio in and out) , in the floppy disc interface (drive 0/1, side 0), and in the serial interface (RTS, DTR). The Atari uses a standard 25 pins D-SUB Female connectors with the following pinouts (the last column showsa standard PC parallel interface connector for comparison). As you can see the Atari I/F is missing the signals on pins 10 and 12 to 17. It is possible to use a "standard printer cable" with the Atari. Many of the wires are not used due to the fact that several of the standard parallel port pins are not connected as already mentioned. Most printers from this time (like the EPSON LX800) where using a 36 CENTRONICS female connector. Therefore the most commonly used cable was the DB25M to CENTRONICS 36M printer cable. The printer interface provides an easily programmable bidirectional interface to the external world and was therefore used in several projects. The printer interface is used by several solutions to provide a fast communication channel between two computers (up to 100KBds). A description of this cable can be found at the PARCP site. it is basically a DB25M-DB25M data-switch cable (with all pins connected directly on both side) where the wires connected to pins 1 and 11 are switched on one end. This results to data signals connected bit to bit and strobe from one side connected to the busy on the other side plus of course the ground. FYI: I have successfully used the PARCP program with this cable, but I did not succeed with HDD_DMN3 program, and I did not try the other solutions (St-Trans and Plip). Note that the data signals (pins 2 to 9) are connected to bidirectional ports on both side, and they are usually initialized to the default output mode (usually a printer is suppose to be connected to this port) with an unpredictable value (i.e. 0 or 1). Therefore it is possible that any particular data bit from an output on one side is at 0 and on that the output on the corresponding other side is at 1 (or vice-versa) resulting in an electrical conflict. Electronic interface circuits are relatively tolerant but this situation should be time minimized by either setting the ports into the input mode during startup of the computers (programs are provided as part of the PARCP solution for this matter), or by inserting a 1 KOhm to a 10 KOhm resistor between each data signals. For that matter a 8 x 10K resistor pack can be inserted inside a connector on one side. To create backup of "copy protected disk" the BLITZ solution uses a special cable and software to backup protected disk. You must have an external drive to use the BLITZ solution but there is no internal wiring or modification done to the computer. The BLITZ cable copies from drive 1 to drive 2 using at the same time the disk an printer interfaces (it reads Drive 1 and writes Drive 2 at the same time). The BLITZ solution allows to backup protected and non-protected disks. This interface allow to connect up to 8 external devices with a speed of up to 1MBytes / Sec. The interface is also called the Hard Disc interface because usually it it used to connect hard-disk, or the ASCI interface because it uses an Atari's proprietary hard drive connector/protocol similar to SCSI (which was standardized later) but unfortunately is not directly compatible. The DMA interface takes its name from the fact that it is connected internally to one of the Atari specially design circuit: the DMA circuit. An interrupt request signal that goes to input I5 of the MFP to generate an interrupt. The DMA/Hard disk interface uses a very unusual and hard to find D-SUB 19 female connector. To connect a hard disk like an Atari SH204/205 or a Megafile drive you will need to DB19M-DB19M Cable. All matching pins are directly connected from 1-1 to 19-19). As we will see the FD interface uses a very uncommon a hard to find DIN14 female connector. Most of the signals of this interface are connected to the Floppy disc controller chip (FDC) the Western Digital WD1772. Only few other signals are connected to the Sound circuit as shown in the parallel interface. By default on both Atari STF and STE the straps on the motherboard are set so that Pin 5 is connected to signal Drive1 Select . This allows to see an external floppy drive, that uses the Pin 5 for selection, as drive B. So the internal drive is A and the external drive is B. This works with most external floppy drive for example a SF314/SF354 from Atari or a CSA354 from Cumana. Usually external FD drive have a data cable coming out directly from the drive without connector and terminated on the other side by a DIN14 male connector that plug into the Atari FD interface. In some cases it is necessary to use a DIN14M-DIN14M cable. This is the case for example with Discovery Cartridge where the cable is plugged on one side to the Atari FD connector and on the other side to Discovery Cartridge DIN14F connector labeled Computer. This cartridge is associated with a specific program allow to backup "copy protected disks". In this kind of cable all corresponding pins are connected directly: from pin 1-1 to pin 14-14 as well as the shield of each connector connected to the shield of the cable. There is also a non standard cable to connect an external FD drive to an Atari called the BLITZ cable (described above). The Atari ST video signals are connected mainly to the Video Shifter circuitry as shown on the right side. The Audio out and GPO signals are connected from the Yamaha YM-2149 sound circuit, and the synchronization signals are coming from the Atari Glue chip. For an Atari STE the video circuitry has been changed. However it stays close to the ST. Plese refer to the STE Hardware page for more information. For more information about the Atari video and how to connect moder monitor please refer to my Atari ST video page. Some Atari models have an RF modulator included (e.g. 520STFM) in this case they are equiped with a special connector for TV. You just need to connect this output to your TV antenna and to tune your TV. This output can also be used with a special box to connect to a VGA monitor. The Video connector used on the Atari is a rather unusual and very hard to find 13 DIN Female connector. This connector carry out all the video signals (RGB and Sync) as well as audio in and out and a general purpose output pin. The following table shows the pin-out of the Atari 13 DIN Female video connector from the front (external) side. This pictures show DIN13 female connectors and male connector. This pin is connected to the Atari output amplifier. It normally goes to the Atari monitor sound system; it is possible to connect a 600 Ohms headphone on this output. If an RF modulator is present (In this case the Atari board contains several extra components - among them is the RF modulator) this signal is a composite video output encoded in PAL or NTSC (Encoding is done in PAL or NTSC based on the country. This is obtained by using different components values and straps on the Atari main board). Note that this signal also contains the combined H & V synchronization signals. This same signal is combined with the audio into the RF modulator. If no RF modulator is present then this signal contains a composite H & V synchronization signals. This pin is connected to pin 17 of the MFP68901 circuit and is used to set the Atari in Hi-resolution when grounded and to Med/Low-resolution when left open. A transition on this pin generates a reset of the system. On a STE pin 3 must be left open for the detection to work. When pin 3 is grounded this input is used to provide an external video clock to the shifter. This allows synchronizing the video-timings with an external device so that a video Genlock device can be used without having to make any modifications to the Atari hardware. An audio signal on this pin is mixed with the Atari internally generated sound and the resulting signal is sent to the Audio output pin 1. Usually not used. 12V / 10mA pin (STE) : On STE this pin is connected to 12V. It is important to use good quality cables to carry the video. The cable must be at least shielded externally, and the color / mono signals should preferably use coaxial wire (especially for long cable like SCART). Here is an example of a good cable to connect to the Atari DIN13 video output connector. The cable is constructed from three 28 AWG (75 Ohm) coaxial cables plus three 26 AWG twisted pairs and two 26 AWG conductors to ensure signal integrity. Coax cables feature a tinned copper braid providing 93% shield. The cable is shielded by a tinned copper braid providing a minimum of 85% coverage, Mylar® aluminum foil and drain wire to provide 100% coverage. As pins on the Mini-DIN 13 connector are very packed it is therefore recommended to use heat-shrink tubes for proper isolation of each pin. The shield(s) of the cable and eventually coaxial cables need to be connected to pin 13 of the DIN connector. If the colors are washed out it is recommended to connect the RGB / Sync signals through 150 Ohms resistors to drop voltage from 1v to 0.7v. On an Atari the RGB output signals already pass through 27 Ohms resistors on an STF and 75 Ohms resistors on an STE, and therefore in most cases these resistors are not required. It is also recommended to connect the Blanking signal through a 75 Ohms resistor. The V-Sync output signals already pass through 33 Ohms resistors and therefore in most cases this resistor is not required. Most of the cables you buy in the commerce do not have any of these pass-through resistors. Connection of the audio out from Atari to pin 2 is not mandatory as pin 6 is the mono input. Some people only connect Atari GND (P13) to SCART P21. I believe this is not sufficient and that it is better to also connect pin 4, 5, 9, 13, 17, and 18. This cable is useful if you have an Atari ST equiped with an RF modulator. IN that case the Atari produces on pin 2 of its video connector a composite video signal (instead of a composite sync signal). 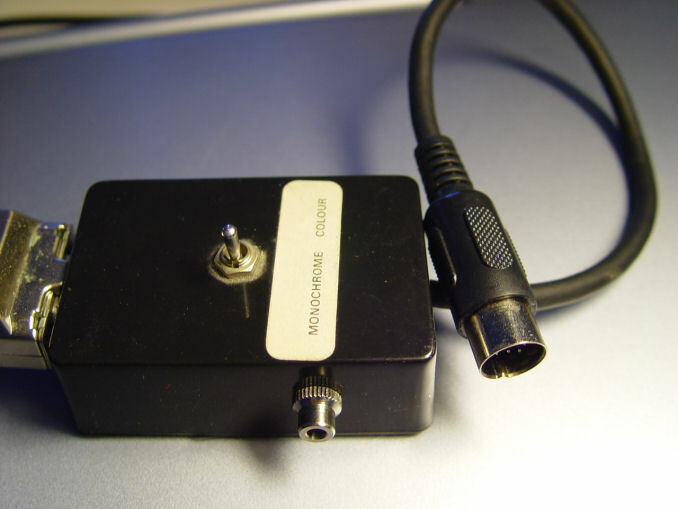 It is therefore possible to use this signal on an equipement that have an RCA composite video signal input (the Yellow or phono input -- see here) like for example the Supera Color HD Box. The White and Red audio RCA plugs are connected to the audio output of the Atari. Here is an example of a RCA Composite video cable. If the colors are washed out it is recommended to connect the RGB / Sync signals through 150 Ohms resistors to drop voltage from 1v to 0.7v. This cable allows to connect an Atari operating in High-resolution monochrome mode to a VGA/SVGA Monitor. The cable uses on one side a DIN13 male connector and on the other side a D-SUB15 male connector . The Atari is automatically set to Hi-resolution mode when this cable is connected (pin 4 set to ground). Note that if you want to hear the sound from the Atari you need an extra audio cable (connected to pin 1) going to an audio connector (e.g. a mini jack or RCA connector). This cable allows to connect an Atari running in Med-Low resolution color mode to a VGA/SVGA monitor. The cables use on one side a DIN13 male connector connected to the Atari and on the other side a D-SUB15 male connector connected to the monitor. The Atari is automatically set to Med/Low-resolution mode (pin 4 left open). Note that if you want to hear the sound from the Atari you need an extra audio cable (connected to pin 1) going to an audio connector (e.g. a mini jack or RCA connector). Important notice: This solution only works if your monitor accepts a 15.75 kHz Horizontal sync (see Connecting Modern LCD/CRT Monitors to an Atari for the video signals charateristics). This cable allows to connect an Atari running in High resolution monochrome mode to a VGA multisync monitor with a DB9 connector. The cables use on one side a DIN13 male connector connected to the Atari and on the other side a D-SUB9 male connector connected to the monitor. The Atari is automatically set to Hi-resolution mode. Note that if you want to hear the sound from the Atari you need to have a separate audio cable going to an audio connector (e.g. a mini jack or RCA connector). 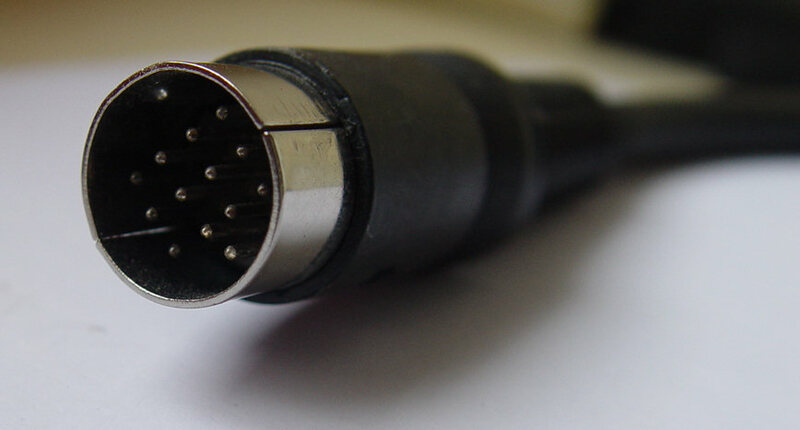 This cable allows to connect an Atari running in Medium-Low resolution color mode to a VGA multisync monitor with a DB9 connector. The cables use on one side a DIN13 Male connector connected to the Atari and on the other side a DB9 male connector connected to the monitor. The Atari is automatically set to Hi-resolution mode. Note that if you want to hear the sound from the Atari you need to have a separate audio cable going to an audio connector (e.g. a mini jack or RCA connector). If you have an Atari SM124 High resolution monochrome monitor as well as an Atari SC1224 color monitor then it is a good idea to use an Atari monitor switcher. This will allow you to switch from one monitor to the other without plugging/unplugging cables. You need a four circuits toggle switch and an enclosure (preferably a metal one) as well as a male DIN13 connector for the cable and two female DIN13 connectors to put on the enclosure. The four circuits of the toggle switch are called A, B, C, D with the input being "in" and the output "1" & "2". For example Ain is connected to A1 if switch is in position 1 and to A2 if switch is in position 2 and of course the four circuits toggle at the same time. This picture show an example of this kind of video switch. To use a NEC Multisync II (or Multisync 3D), or for that matter any other multisync monitor that support both the Hi-resolution mode as well as the Med/Low-resolution mode of the Atari ST, you can build a special switch box that will allow you to directly switch between these two (mono/color) modes without the need to change any cable. You need a box (preferably a metal one), a four pole double throw toggle switch, a DIN13 male connector, and a male DB9 connector. A first cable is connected on one side to a DIN13 male connector and on the other side to the box. A second cable is connected on one side to the box and on the other side to a DB9 male connector. The four circuits of the toggle switch are called A, B, C, D with the input being "in" and the output "1" & "2". For example Ain input is connected to A1 output if switch is in position 1 and to A2 output if switch is in position 2. The four circuits of the switch toggle at the same time. Note: If you plan to use this kind of switch box to connect a recent monitor you can replace the cable with the DB9 male connector by a DB15 female connector directly placed on the swich box (last column in blue of the above table). This allows you to connect a recent monitor with a standard DB15-DB15 cable and for a NEC Multisync monitor you will need a special DB15-DB9 cable/adapter. But remember that this solution only works if your monitor accepts a 15.75 kHz Horizontal sync (see Connecting Modern LCD/CRT Monitors to an Atari for the video signals charateristics). Also not accessible from the outside the keyboard is connected to the main board through a connector. The keyboard, mouse, and joysticks are handled by a dedicated processor the 6301 that includes an internal ROM and RAM. The schematic of the keyboard shows how the keys and the mouse/joystick connectors are connected to the microprocessor. The keyboard communicate with the main system through a serial interface a 6850 ACIA. Accessing the mouse/joystick connectors is not easy as it is located under the keyboard. However as all programs uses a mouse and most games uses the joystick it is necessary to unplug the mouse and plug the joystick each time you want to play a game and vice-versa. This is obviously not very practical and therefore it is recommended to buy a mouse/joystick switch that allow to connect permanently two joysticks and a mouse and to select with a switch between the mouse and joystick on port 0. This following picture shows this kind of switch. The Atari STE has two RCA Audio output ports for stereo (labeled left and right). The Atari STE has two joystick DB15F connectors on the left side of the system. This section presents several connectors/adaptors which are non specific to Atari but useful. Note: information between parentheses is for non standard extensions. This is the standard used for very old monitors. Note that there are two totally different standards. The VGA9 has been used mainly for Multisync monitors and the EGA/CGA has been used on early IBM machines / monitors. This connector (Ushiden connector) is used to carry the S-Video signals. 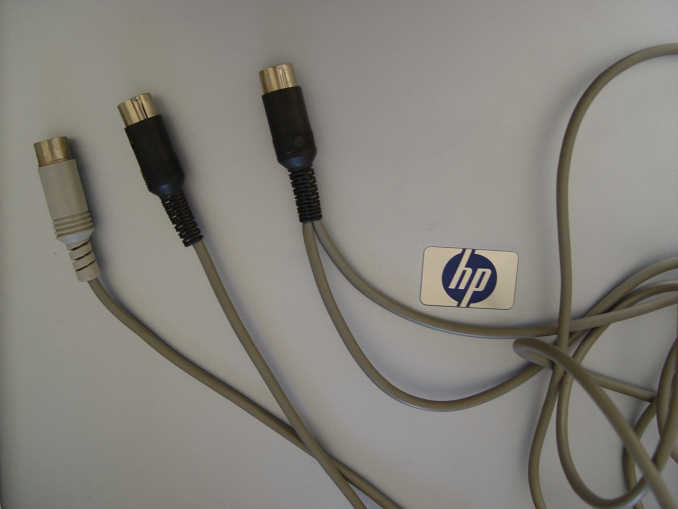 This can either be an adaptor (usually DB15 male to DB9 Female) or a cable (DB15 male to DB9 male) which is used to connect an old monitor with a DB9 female input to the output from a computer with standard VGA DB15 female connector. See pictures here and here. This adapter is used to convert from/to SCART to/from S-Video or Composite. It is usually provided as a box with a 3 circuits switch, one or two SCART connector(s), a S-Video connector, 3 RCA composite connectors (Yellow, Red, White). The 3 circuits of the toggle switch are called A, B, C with the input being "in" and the output "1"& "2". For example Ain input is connected to A1 output if switch is in position 1 and to A2 output if switch is in position 2. Audio on RCA (Red and White) are switch from/to SCART Audio in or out Composite on RCA (Yellow) is switched from/to SCART Composite in or out S-Video Color (4) is always connected to SCART Red / S-Video C out S-Video Y Luma (3) is switched from/to SCART S-Video Y in or out. It is highly not recommended to open this kind of video adaptor. Plastic is sealed and breaks during opening and wires are very fragile. See an opened adapter below. Atari Cable document. - Text document from unknown source that provided lots of information.